A new wave of uptightness has cost us another freebie. There will be more disappearing if we don't defend them. Someone ratted on a home improvement store in Camarillo, Calif., for giving away doughnuts and coffee. It seems the store needed a stainless steel sink with hot and cold water on the premises to make it legal, the local health department said after it got word. So ends a 15-year-tradition for the owners of B&B Do It Center and its customers. Let us ponder the absurdity. Does this mean that every trade show will need a nod from the authorities to hand out popcorn? Will Realtors have to clear the M&Ms out of the open house candy dish? And what about those pediatrician-issue lollipops that are plaguing our nation? The niceties are going to disappear. By that I mean the free niceties that you can digest. 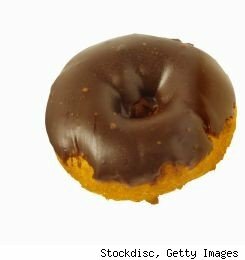 CNBC's Jane Wells wrote in a column about the doughnut policy that nothing is better than free food. I agree. On the flip side, nothing is worse than having free food taken away. And when knuckleheads who don't get nuance dictate the law, we get more taken away. I love strolling through Trader Joe's and returning to the tasting stations every so often for a refill. I sometimes send my daughter back for thirds and fourths because who's going to say anything to a cute 6-year-old? The point is, the gratis snacks cost the store pennies per person, while I'm racking up a $50 grocery bill. But I'm doing it with a smile and my mouth full. Trader Joe's presumably meets food-preparation requirements, but if the store ever eliminated its free samples, it wouldn't be Trader Joe's anymore. Ticky-tack law enforcement is making life a little less delicious. It also makes merchants wary of generosity because someone, somewhere wants to legislate it out. Especially in these tough times, small business needs to offer the little enticements for bigger return. A hardware store I frequent in Brooklyn called Pintchik offers a bag of popcorn to every customer. As long as I'm getting something for nothing, I just might open my wallet a little wider for the thing I don't need. "It gives the business personality," said Michael Pintchik, the co-owner with brother Matthew, told WalletPop on Tuesday. "It differentiates. It indicates that there's people with a little life and warmth, as opposed to a sterile business." And it's a best practice, if you want to reduce it to marketing strategy. If the best things in life are free, why do some of us spoil it when someone wants to give it away?